I have a hard time with that. Because if I say to someone, ‘You know, it’s about vampires,’ then immediately they have this mental image of what the book is like. And it’s so not like the other vampire books out there-Anne Rice’s and the few that I’ve read. It isn’t that kind of dark and dreary and blood-thirsty world. Then when you say, ‘It’s set in high school,’ a lot of people immediately put it in another pool. It’s easy to pigeonhole with different descriptions. Despite of the novels’ success there were opponents as well who attacked Meyer as a poor writer. Other compared her to J.K.Rowling, the author of the Harry Potter series, saying that Rowling’s style is what makes her a great author. Meyer instead depends on the speed of actions. 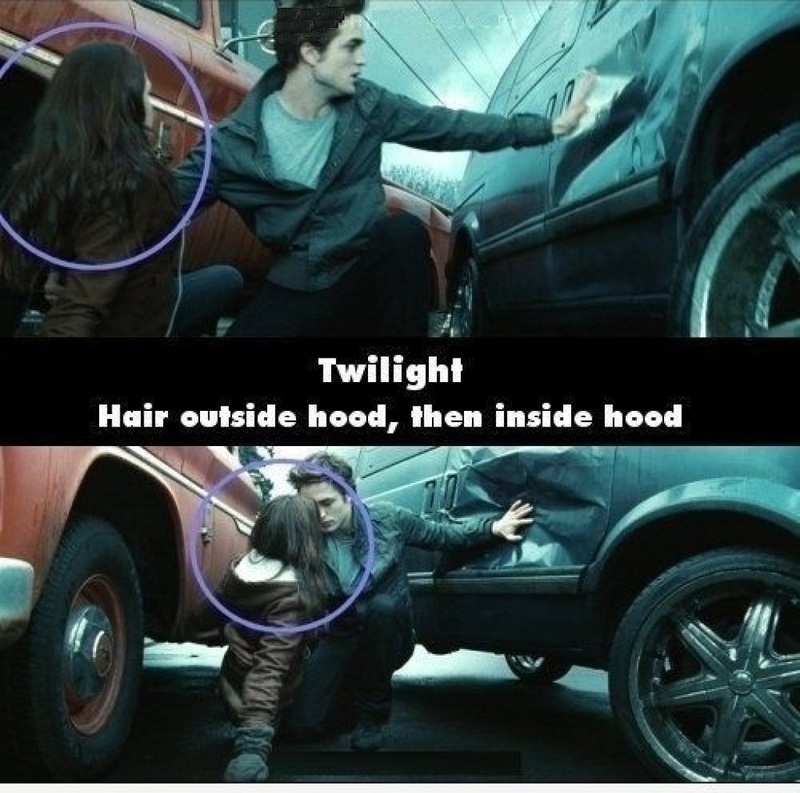 10 Edward tries to save Bella from a possible accident, and Bella’s hair was outside the jacket in the first shot. However, in the second shot, her hair is out and even covering the jacket’s hood. 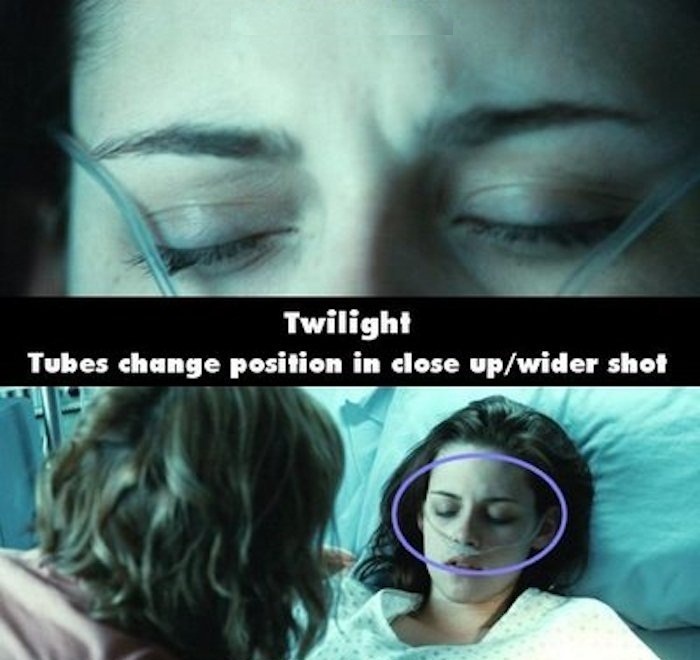 8 The breathing tubes in the scene when Bella was in hospital were on her cheeks. However, with the camera zoom the tubes change place to be very close to her eyes. 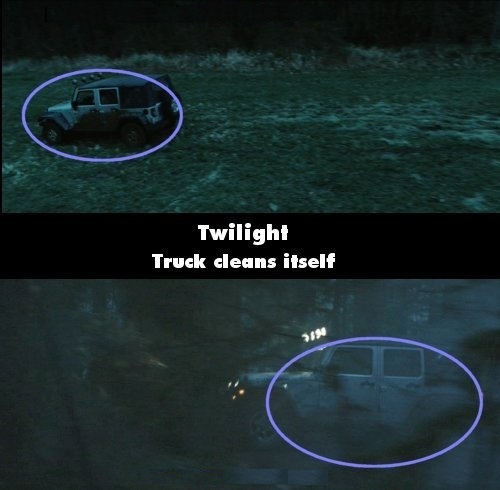 7 The Jeep belonging to Emmett in the scene where he leaves the basketball field, there is a change seen in his car. Instead of being muddy with dirt on tires, the car changes state in the very next shot to the clean one. 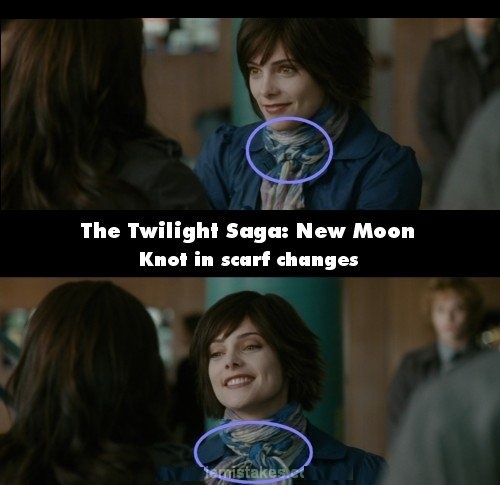 6 In the scene when Bella accompanies Alice to go to Volturi, Alice is wearing a scarf in the whole scene. In two shots, however, the knot changes size and colors. In the first shot, the knot is bigger, and in the next one the knot’s colors look different. 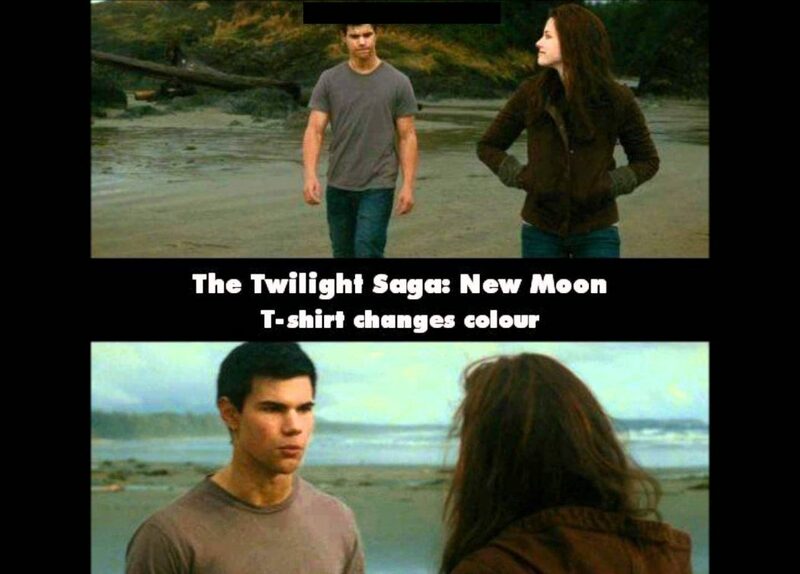 5 In the scene Bella and Jacob talking on the beach, Jacob changes shirt often. 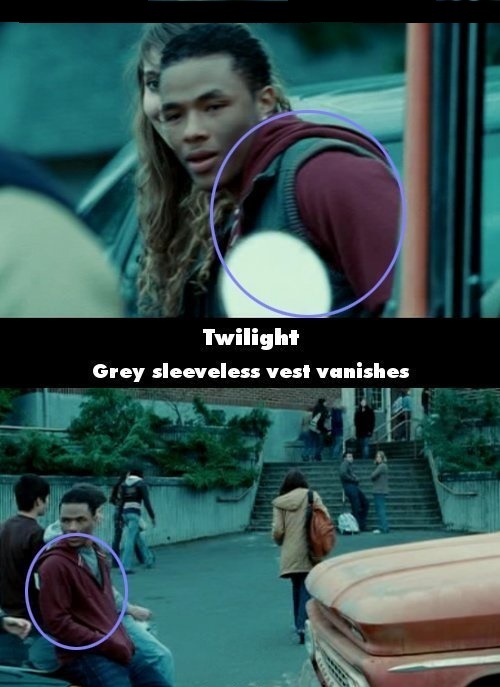 In one shot the shirt appears in a grey color; then turns brown. This color changing continues to appear during the scene! 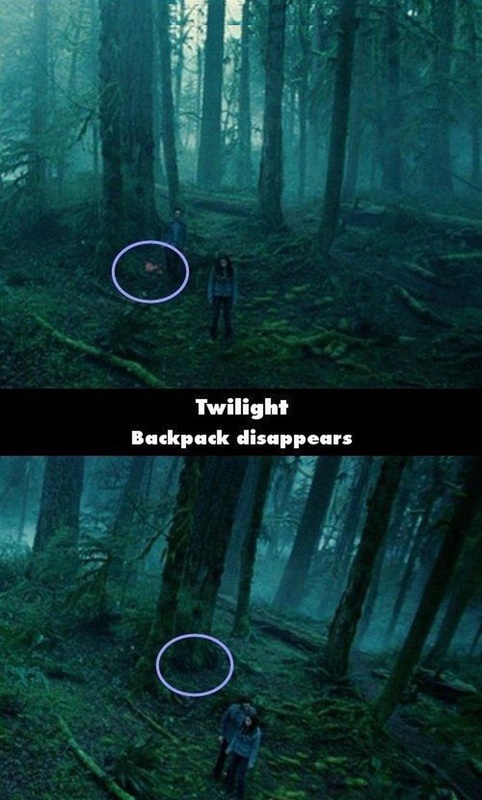 4 The scene when Bella and Edward were talking in the woods, Bella already comes with her rose backpack that she throws over the ground. In the very next shot, the bag is not there. 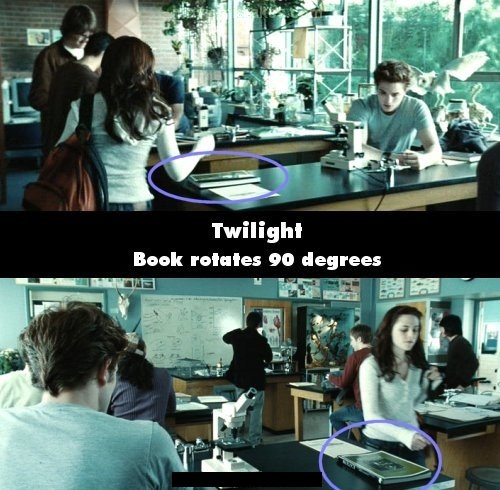 3 As Bella comes to her biology class when Edward comes back, she passes by him and on the table there were a book and a sheet of paper that change places in to subsequent scenes. In the first scene, the book was closer to the paper and looked horizontal while it became vertical in the next one. 2 In the scene Bella travels to Italy in order to help Edward, Alice gives her a lift. When they arrive and Bella gets out of the car then turns to talk to Alice, at a closer look she was in front of the car’s door. Zoom out, she is behind the door! 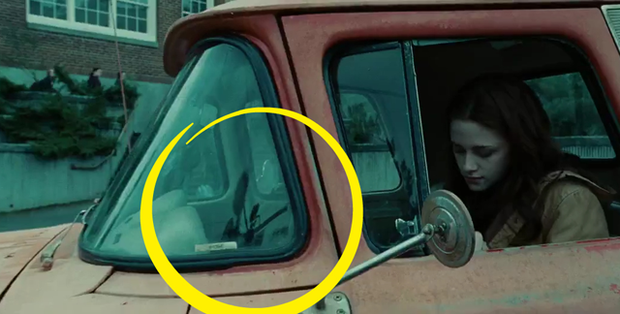 1 When Bella gets in her truck in the first day at school, a reflection of the camera and mic are seen in the cars window!